In Kiven Pierre’s home country of Guyana, cheap electricity is a valuable commodity. “The majority of energy systems in the Caribbean are based on diesel, heavy fuel oils. It makes electricity very expensive,” says Pierre G’13, a Whitman Ph.D. student who earned an M.B.A. in May. According to his research, costs can range 28 to 30 cents or more per kilowatt hour in the South American country, four to five times as much as in New York State, which is about 7 to 8 cents per kilowatt hour. He’s created two companies—CaribVentures Consulting and El Dorado Energy—that are geared toward making the most of the sun and sustainability. Both ventures placed in the semi-finals in different years of the campus-wide Panasci Business Plan Competition through Whitman’s Falcone Center for Entrepreneurship. 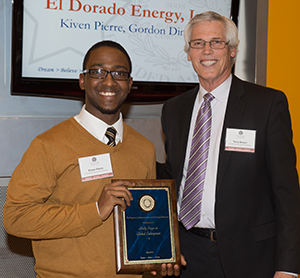 El Dorado Energy won $10,000 as part of the Raymond von Dran IDEA Awards at the Emerging Talk conference earlier this year at SU. CaribVentures Consulting is a start-up providing consulting services to entrepreneurs and small businesses looking to put in place sustainable initiatives and practices. The vision for El Dorado Energy, which won Panasci’s Holtz Prize in Global Enterprise, is to promote solar leasing by installing residential and commercial solar systems and selling the clients the electricity. “Our aim is to make the electricity much more cost efficient, ecological and socially conscious,” Pierre says. Pierre and his partner in El Dorado, which operates out of Whitman’s Couri Hatchery, were surprised by their win in the IDEA Awards, but were encouraged by the recognition. Kiven Pierre receives an award from Terry Brown, director of the Falcone Center for Entrepreneurship, during the Panasci Business Plan Competition. 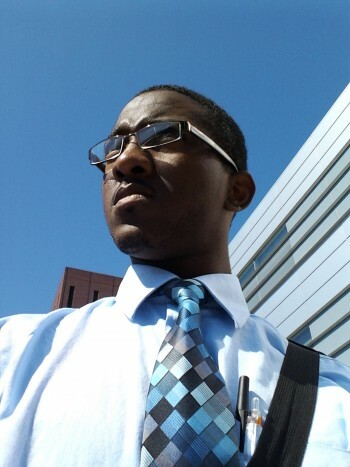 Pierre, who earned an undergraduate degree in business administration at Morgan State University in Baltimore, focused on entrepreneurship and sustainability during his master’s coursework, completing a certificate of advanced study in sustainable enterprise (CASSE). The CASSE is open to all graduate students in every program at SU and SUNY ESF. It provides a solid grounding in sustainable enterprise and an enhanced understanding of the relevance and practice of sustainable enterprise within each student’s discipline. Along with the required courses and electives, Pierre worked with a team on a capstone project that studied an aquaponics company. “We evaluated the company from a sustainability perspective—inclusive of economic, environmental and social considerations—then made recommendations,” he says. In his work aside from his studies, Pierre serves as vice president of career development for the SU-ESF Net Impact chapter, which promotes the idea of sustainability through corporate and university chapters that embrace the concept. He also conducts his own research into social and sustainable entrepreneurship. Pierre also works with Todd Moss, an assistant professor of entrepreneurship at Whitman and faculty director for the Sustainable Enterprise Partnership, on identifying emerging markets for sustainable entrepreneurs. Graduate students who are interested in pursuing the CASSE should enroll in Managing Sustainability, BUA/ECS 650/EST 696, in spring 2014 and can contact Professor Todd Moss for further information at tmoss@syr.edu.